Is this a good option for type storage? I came across this storage piece online and wanted the feedback/opinion of more experienced folks who’ve dealt with type storage issues. * 57”H x 20”W x 14”D. * Inside dimensions of drawers: 2.25”H x 16”W x 10.5”D. * Fully assembled, except for casters. 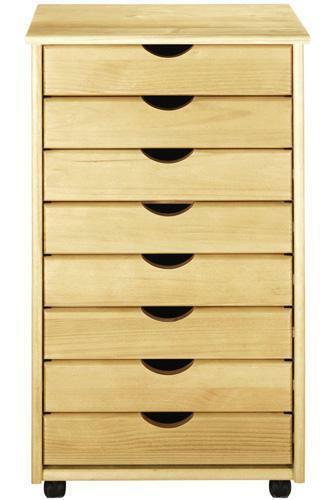 Now, I know that I’d have to find individual “cubbies” to properly store the type in each drawer, but I’m thinking that 8 drawers for $279 isn’t a bad deal. There’s one with 12 drawers for $399. Good? Bad? I think you can buy a lot of used California job cases and build (or possibly buy) a simple frame cabinet to hold them for $279. This will in the end be a better way to store the type, help you use the type as it will be distributed properly, and be more cost effective in the long run. And the frame cabinet will likely be a lot easier to build than dividers in those drawers that don’t seem large enough to accommodate sufficient divisions to hold the type anyway. Contact Alan Runfeldt at: [email protected] who I know has a lot of cases for sale as well as several complete cabinets. He’s in New Jersey so perhaps shipping and its costs would be prohibitive but then I’d post a Wanted ad at this website asking for cases. My reason for asking in the first place, that failed to mention, was that this is a more reasonable size for my small studio, which serves double duty as a graphic design studio and letterpress studio. As is, I’d be looking for a 2/3 type cabinet. Ultimately, though, you hit the nail on the head: shipping anything to Florida would virtually double the cost because of freight charges. Still, I’ll post a request in the “wanted” ads and see how it goes! Ah yes, space. I’m set up in my living room, or rather what used to be the living room, so I know what you mean. For a full size cabinet you’d need about 40”. A 2/3 cabinet would only be slighly smaller but then again, those few inches may make all the difference. Since you’re in Florida you may want to contact Sal Zampino who sells cases and other supplies. He’s in Parkland and his number is: (954) 344-9464. I’ve never bought anything from him myself but it would be worth the call I think. This cabinet might be a good option if you could use some of the molded plastic type trays — I think it was Larry Raid that had them for sale. You could probably fit two or three across in the drawers and stack them two or three high in each drawer — 3x3 would give you 9 per drawer. They’re best for small fonts and particularly well suited to cap fonts, but they might answer the need. However, for $279 you could also buy probably ten to twenty 2/3 cases used from a good source like Letterpress Things. There is also a used equipment dealer in the Tampa area — ask Richard Mathews at the University of Tampa Book Arts Program about him. There’s something about a type cabinet that makes for a better experience for the letterpress printer (my opinion). The method of selecting the sorts from the case and the distribution of the sorts is an important part of the process. I used plastic trays for a while and they worked OK. Keep your eyes open for a type cabinet, the reward will be much greater for you as you gain more experience. I have a stack of 2/3 cases for some of my type. They can hold 3 or so fonts of 12 pt. each. I currently have 4 of them stacked on a shelf. It isn’t ideal, but it works for me, since I don’t use them much. A cabinet maker could put together a very stout, very simple frame with handles for a half dozen 2/3 cases for only a few hundred dollars. You would end up with something 24” wide, 18” deep and 12-16” tall. Not a bad way to store (potentially) 150 pounds of type. And it would have all the benefits stated above. you can buy full size original Hamilton California case drawers that are in great shape from Don Black (www.donblack.ca) at this very moment for $10 CAD each, $5.00 for blank cases. Granted, the shipping of 10 or 12 drawers from Toronto, Canada may run you an adt’l $100 tops, but as “rpolinski” mentions above, you’d end up with the “real thing” for approx $220, leaving you another $200 to build a proper cabinet for your drawers. Don might still have entire cabinets for sale as well. Rich P. was right. He’s been to my shop frequently and as seen the cases and cabinets I’ve collected over the years. I have far too many for my own use and have begun selling off the spares to support the museum. Most of them are full- sized, but I do have a number of 2/3 California job cases - and cabinets and racks - that would serve your need. That little cabinet in your photo is quite charming, but also somewhat impractical for storing type that you want to be able to get to and set and distrbute. I also have some old Kelsey made - and some very nicely old home made 12x12” cases. These are simple cap style cases that were sold by Kelsey for cramped quarters, small fonts and limited budgets. AND I also have some small cabinets that will hold them. AND, I have just removed a number of plastic Ludlow cabinet inserts from my newly converted engraving & wood type (formerly Ludlow Mat) cabinet which will each hold a cap font - of Ludlow Matrices, but would be ideal for storing type as well. I’ve even been toying with the idea of fabricating a 5-case modular cabinet that would be ideal for Little Rubber Feet - or anyone who wants to store 5 2/3 cases, but lacks the floor space for a 10-case cabinet - but might want some thing to solve the current problem yet have the option to expand as the type library grows. How many fonts do you want to store? I’ll get some dimensions and take some photos later today and post them for you and everyone to see this evening. That sounds intriguing. I’m looking to store at least 8 fonts, with the possibility of more, of course. Thanks for everyone’s advice! It’s greatly appreciated! I have been using Plano plastic boxes (Fishing or Beading) The one I like is Model 3700. 1 will fit either LC or UC with #’s and Punctuation. Although to do that you need to get more dividers. But they are Under $4.00 each at Lowe’s. I like them because they have a lid.